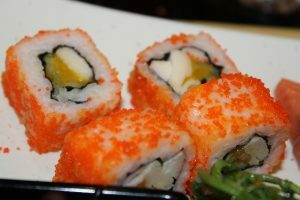 The California roll is very popular especially among the sushi lovers who prefer eating raw seafood. In most cases, it may contain crab meat bar (kani), avocado and cucumber. 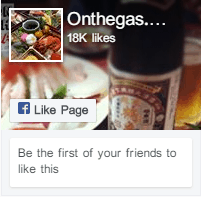 Some people, like in my case, prefer to use carrots, pickled daikon, or fruits like banana or mango to spice it up and achieve a flavor of their liking. 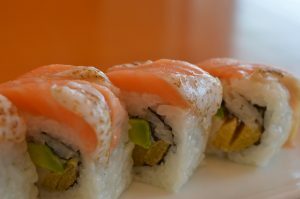 The California inside-out roll (also fondly referred to as Uramaki), is widely used as a base for the preparation of different sushi rolls. Preparing the King roll sushi is an easy procedure. 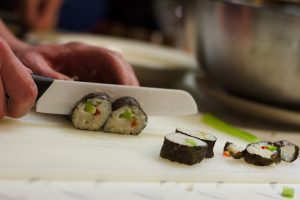 It even gets easier if you’re used to preparing the uramaki way. In my recipe, instead of using the usual whole surimi bar, I will make the roll a little bit creamier by adding extra Kewpie with shredded kani. After preparation, the roll is served hot with a touch of scallion, tobiko, pickle garnishment, and roasted sesame. Finally, I will fold and tear/cut the nori into smaller bite-size rolls. I usually start out by covering the bamboo rolling mat with plastic covering (plastic wrap). 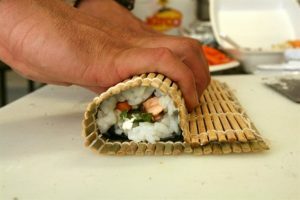 Then, I proceed to place the nori onto the wrapped bamboo mat in such a way that the smooth side of the nori is in direct contact with the mat. The next step is to prepare a mixture of water and 2 tablespoons of vinegar in small bowl. I then use the solution to wet my hands in order to avoid stickiness. I then place some rice balls on the surface of the nori and gently spread and knead the rice onto the entire surface without mushing. The next step is to turn the nori upside down (in such a way that the rice covered surface now faces downwards and the smooth side faces upwards). I then slide and spread a spoonful of the mayo-crab (the mixture of Crab and Mayonnaise) lengthwise, on top of the nori, then follow up with the avocado and cucumber, before rolling with the mat, to form a spicy inside-out California roll. From there, I move to arranging the finely sliced salmon pieces on the California roll to cover its length and then gently roll the plastic wrapping to shape and hold them in place. It is advisable to let the roll stand for at least 2 minutes before proceeding into the baking phase. 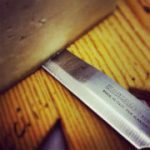 First, I’ll preheat the oven to about 205 degrees Celsius (400F), then use a knife (must be sharp) to cut the roll into equal portions. The next step is to carefully unroll the plastic wrap from each piece and arrange the pieces (with the salmon side up) on a prepared foil wrap. The next step is to prepare a mixture of unagi sauce, spicy mayo, and 1 tablespoon tobiko. I’ll then Pour the unagi sauce and spicy mayo sauce to sufficiently cover the entire roll then fold the foil with four sides up to prevent the sauce spilling out into the oven. The final step is to bake/cook for 5 minutes then drain the remaining sauce. Continue baking for another 2-3 minutes until the mayo starts bubbling again. Top the king roll sushi with some scallion, tobiko and serve with garnishment. • cup of mayonnaise. I prefer using the Japanese Kewpie brand mayonnaise because it is tastier and authentic. Regular American mayonnaise such as Hellmann’s may also do the trick. • 1-2 tablespoons of either the Sriracha sauce or the Sambal Oelek brand chili.